Wooden mirror/picture frame, unstained, made in Camp Petawawa,1940-1942. The frame is constructed entirely of wood, with 3 main parts: the pivoting frame, the frame support, and the base. 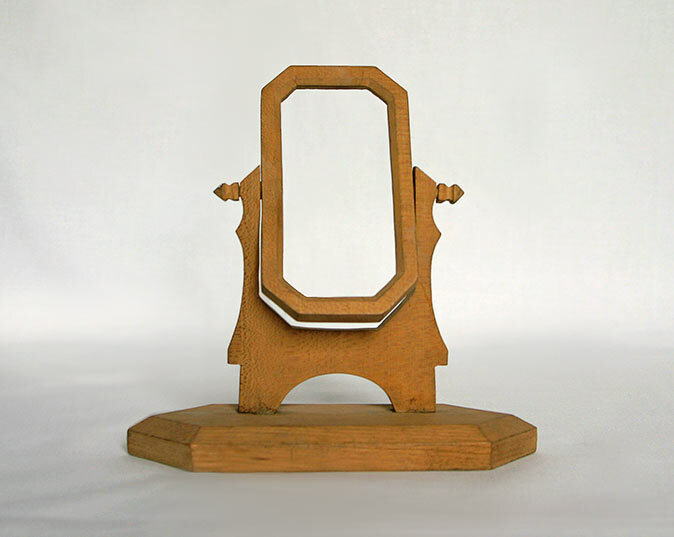 The frame itself is an elongated octagon (4.6 inches high, 2.5 inches wide). The long base is bevelled. Both ends are pointed, resulting in a shape that resembles a rectangle with two triangles on the end. The base measures 7 inches long, 2 inches wide, and .8 inches high. A metal insert, which was reflective and likely used as a mirror, was cut to the measurements of the frame and repurposed from a cigarette tin.